Job Vacancy for Skilled TIG Welder / Fabricator. We are an established engineering and manufacturing company based in Burnham-on-Crouch in Essex. We are expanding and require skilled TIG Welders to become part of our team. We have multiple vacancies for Skilled Tig Welders. Experience in welding stainless steel, 1 to 3 mm thick to a good visual standard required. Coding is not required. Work will involve the production and Tig welding of components and assemblies for use in Medical equipment. These require neat and consistent welds to a high visual standard. Mostly this will fine limit welding or fusing. The limiting of distortions is often a priority. Materials are generally 304 / 316 stainless steel sheet of 1 to 3 mm thickness. 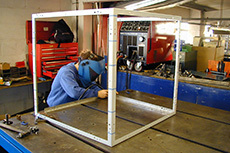 During the interview process a weld test will be required. The jobs are full time, 40 hours per week and based in our factories in Burnham on Crouch, Essex. Overtime is often available. Competitive rates paid depending on experience.